This is a short tutorial about game rules for those who do not know the rules of classic monopoly. If you do know the rules of classic monopoly, we recommend you to read this tutorial instead! Galactic Magnate is played by 2-5 players. 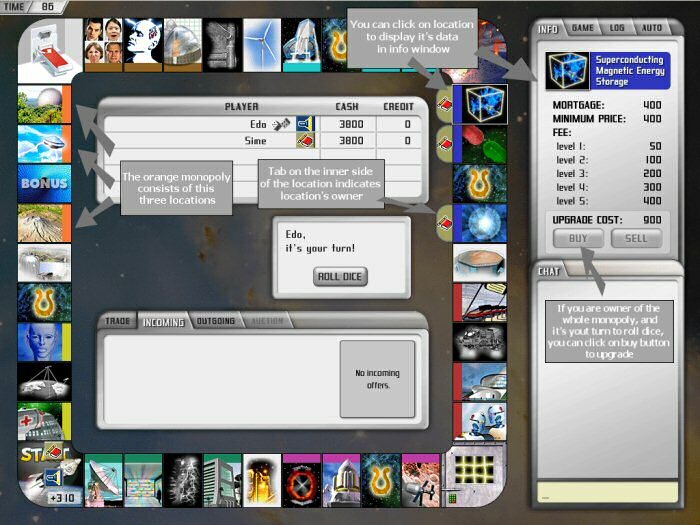 At the start of the game, each player chooses its character, for example soldier, scientist or merchant. The players do actions in turns, one by one. The game is played on rectangular board (see picture), that has four sides. Each side has 10 locations. The characters start from location called start location. They move in clockwise direction around the board. Each player throws two dice, and his characters advances by number of locations equal to the sum on the dice. Each player has some money on the start of the game. The money is shown next to the name of the player (see picture). The goal of the game is to bankrupt all other players. One way to bankrupt your opponents is to acquire monopolies. The monopolies are locations that have the same color (see picture). When you own a monopoly, you can upgrade it by clicking on one of the monopoly locations, and then clicking on the buy button (see picture). You can upgrade monopolies only on your turn. A monopoly can be upgraded for maximum of five times. When another player lands on your upgraded monopoly, he has to pay fee for your services. The fee amount depends on type of the monopoly and the number of upgrades. The user interface is very simple. All actions are accomplished using left mouse button. 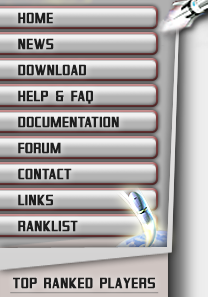 At the start of the game, click on character you wish to play with. When it is your turn to play, click on the 'roll dice' button to roll the dice (see picture). To get more information about a location, like minimum price (to buy location), price of upgrades and fee (that you charge to other players), click on location and information will be shown in upper right corner of the screen (see picture). How to acquire monopolies? To do that, you have to buy monopoly locations one by one. When a player lands on location that can be bought, he can put it on auction. All players participate in auction, and the player to offer most money wins the location. The trick is that most monopolies consist of multiple locations, and you have to buy them all to acquire monopoly. When you are missing that one last location, you may find other players offering lots of money on the auction in order to stop you, any you have to outbid them all. There are other ways in which you can squeeze money out of your opponents, or earn money for yourself, like utilities, extractors, trade and provisions. But how do you get the money? There are two main sources of income. First is the start location. Whenever your character passes over it (character does not have to land exactly on start location), you will get salary. The exact amount is indicated on the start location, and is equal for all players. The second main source of income is the bonus location. Whenever a player lands on bonus location, EVERY player receives bonus money. The exact amount depends on number of alive players in the game and you can find it out by clicking on bonus location and checking the info window in upper right. As the last thing, watch your time. You have limited time to play your moves. Your remaining time is shown in upper right. If you play fast, the time will increase, otherwise it will decrease. If time reaches zero, you will be kicked from the game for playing too slow. The game is not intended to be played at fast pace, you can play it comfortably. The timer is there just to keep players from stalling the game. That would be the short description of the rules. If you want a more detailed description, you can read this tutorial. For experienced players, there is also this comprehensive description of the rules. Copyright Kresimir Cosic 2005-2007. All rights reserved.